How Cavedog's influential 1997 RTS came to be. Retro Gamer is an award-winning monthly magazine dedicated to classic games, with in-depth features from across gaming history. You can subscribe in print or digital no matter where you are by clicking this link. Its current issue celebrates the 40th anniversary of Space Invaders. This feature originally ran in Retro Gamer 183 earlier this year. To subscribe or find out more, head here. Total Annihilation came out when games, and RTS games in particular, were quickly evolving. By the mid-Nineties, PCs were capable of capturing the necessary scale of battles, and online gaming was about to become a phenomenon. And it was that world Total Annihilation creator Chris Taylor was waiting for. We caught up with Chris and asked him about the game's origins. Total Annihilation had many RTS contemporaries, with Z and Command & Conquer: Red Alert both released in 1996, and Total Annihilation sharing 1997 with games like Age of Empires and Dark Reign before StarCraft came out in 1998. Total Annihilation enjoyed immediate success and the kind of glowing reviews any games studio would dream of. But was it helped by the general popularity of RTS games at the time, or was it the other way around? 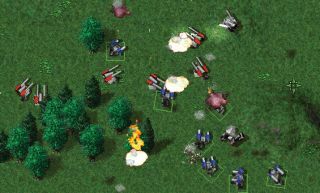 Indeed, Total Annihilation was considered revolutionary in many ways, like its excellent AI, new grouping techniques and the scale of the battles. Then there was the introduction of the Commander, a central, all-important unit to the battlefield that was a big hit at the time. Chris remembers the inspiration for it clearly. “I always believed that RTS was a true strategy game, and having played a bunch of chess, I felt there was a place to insert some of that,” he says. “But besides needing a king on the board for the enemy to focus on, the player needed an avatar, a place to feel like they are connected to the game experience. I imagine I wrote something like this in the design, ‘The player needs to feel like they are part of the game, and the Commander accomplishes that.’ I’m paraphrasing, but you get the idea. Although, one could argue that it really didn’t accomplish that, per se, but it did give the player a sense of, ‘hey, don’t mess with my Commander, or there will be trouble!’ It makes the game more personal. So, if you follow the design logic and say that if the Commander dies, the game is over, then the Commander needs to be powerful.” Placing a metaphorical king onto the field of battle came with some unintended consequences, though. What Chris refers to here is the concept of ‘Command Napping’, as it was referred to by the TA community. As the success of your campaign often relied on your Commander surviving and being active, it would become a tantalising target for opportunistic players. Nigh-unkillable as it was in a firefight, some devious, yet ingenious, gamers found a loophole to taking the Commander out of the game: build an air transporter, such as a Valkyrie or Atlas, fly it over to the enemy Commander, pick it up, and then just fly the aircraft to the far edge of the map, rendering it useless to the opponent, thus crippling their building and development capabilities, which relied heavily on the Commander. Yes, it would have required building several dozen aircraft in the hope that one survived long enough to pick the Commander up from deep within its own territory, but if you pulled it off, it didn’t just give you an advantage—it gave you a great sense of villainous joy. This was merely one of the ways in which Total Annihilation dedicated player base found ways to get the most out of the game and its hundreds of units. In many scenarios, especially for experienced players, one side, Arm, would find a tactical advantage over its opposing side, Core. That, Chris explains, was also unintended: “We never intended for one side to be more powerful than the other. We had always planned (and did for quite a number of months) to release new units, which we believe would continue to shift the balance of power back and forth between the two factions each week. I think that sort of worked.” For those with a taste for the ruthless, The Core Contingency expansion featured 75 new units, including devastating, balance-reinstating Core units. Finally, Chris ponders if he were to make Total Annihilation again from scratch today, apart from having larger and more capable graphics engines at his disposal, whether he would change anything from the original incarnation.